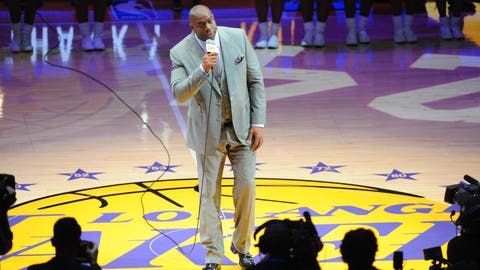 Magic Johnson has re-joined the Los Angeles Lakers in an advisory role. Johnson, the Hall of Famer who won five NBA Championships, three NBA MVP trophies and three NBA Finals MVP awards with the franchise. What does this mean for the future of the Lakers franchise? It’s no secret that Johnson hasn’t been the biggest fan of executive vice president of basketball operations, Jim Buss. Under Jim’s four-year stretch, the team has fallen from the ranks of the NBA’s elite to one of its most unsuccessful teams. The lackluster record under Buss’ management is 82-215 with zero playoff berths and the longest streak of lottery appearances in franchise history. Jim, who has a summer-of-2017 timeline for resigning if the Lakers aren’t contending for a championship, has some decisions to make as the 17-34 team appears to be headed to another lottery trip. Jeannie Buss, while publicly supporting her brother, certainly sends a signal by bringing in his biggest adversary. For his part, Johnson offers a successful business resume but has little experience in basketball operations. His hire is sure to please Lakers fans who are tired of losing. I think it’s safe to say that change is on its way. And while coach Luke Walton’s job appears to be safe, what other management changes might be made? Will there be roster changes? Who knows? We’ll just have to wait and see.